On arrival at Delhi Airport, our representative will pick you up and transfer to hotel for check-in. Freshen up and relax. Later go for a half day sightseeing tour of Old Delhi that includes Red Fort (also known as Lal Quila), Jama Masjid (located just 500 meters away from the Red Fort) and Chandni Chowk among others. Return to your hotel in the evening. Overnight stay at the hotel. Today, after breakfast proceed for a half day sightseeing tour of New Delhi. Explore famous draw cards of New Delhi that include India Gate and Rashtrapati Bhavan (President’s House). Later visit Gandhi Smriti, where Mahatma Gandhi spent the last 144 days of his life. The place has now been turned into a museum. Next on your tour is a visit to Humayun's Tomb, which has now been listed as a UNESCO World Heritage Site. Conclude your day with a visit to Qutub Minar. This 13th-century architectural masterpiece is one of the iconic landmarks in Delhi. Return to your hotel In the evening. Overnight stay at the hotel. Post breakfast check-out from the hotel and head towards Agra. Enjoying a stunning setting on the banks of the river Yamuna, Agra is one of the most famous tourist destinations in the world. On arrival check-in to the hotel. After relaxing for a while go for a visit to Agra Fort, built in the year 1565 by the Mughal Emperor Akbar. Later, visit the Taj Mahal. This white-marbled architectural magnum opus was built by the Mughal Emperor Shah to commemorate his deceased wife – Mumtaz Mahal. After day-long sightseeing return to your hotel. Overnight stay at the hotel. On the 4th day of your Delhi-Agra-Jaipur tour package, check out from the hotel after breakfast and drive towards Jaipur. On the way, stop at Fatehpur Sikri, the deserted capital of Emperor Akbar. Later resume driving to Jaipur. Also called the “Pink City”, as most of the buildings are painted pink. With prominent monuments, mighty forts, impressive palaces, vibrant markets, hospitable people and beautifully laid-out gardens, the city has everything to be a perfect tourist destination. On arrival, check-in to the hotel. Overnight stay at the hotel. Post breakfast, proceed to Amber Fort (also known as Amer Fort). On arrival ,ride a beautifully adorned elephant to the top of the fort. Visits to City Palace, Jal Mahal (en-route quick stopover), Hawa Mahal (from outside only) and Jantar Mantar are also part of your itinerary. In the evening, get ready for a slice of the traditional life of Rajasthan on a visit to Choki Dhani. After visiting Choki Dhani, return to your hotel. Overnight stay at the hotel. Your Golden triangle tour concludes today. Enjoy a delicious breakfast, check-out from the hotel and drive to Jaipur/Delhi Airport to board a flight to an onward destination. An eclectic mix of history and modernity in Delhi, fine specimens of Mughal architecture in Agra and the splendid remains of Rajput rulers in Jaipur; all these and more can be explored with Golden Triangle tour packages. Starting from Delhi, it takes you through some of the most interesting experiences, including sightseeing in Delhi, marveling at the jaw-dropping beauty of monument of love Taj Mahal and appreciating the regal splendor of Jaipur. This 6-day-5-nights itinerary is beautifully crafted to acquaint you with most interesting destinations in North India. So book your package today, pack your bag and set out to discover these interesting destinations in north India. 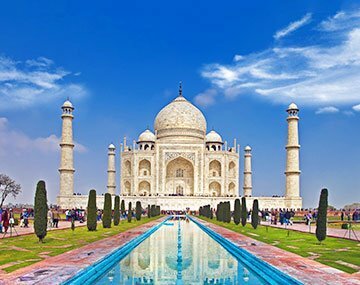 Fascinated by attractions and activities in Delhi, Agra, and Jaipur, and searching for discounted Golden Triangle tour packages to explore them? If so, BookOtrip has perfect deals to make your dream a reality that too within your budget. Through years of experience in offering tour packages for Delhi, Agra and Jaipur, we have formed valuable relations with hotels, transport services and other service providers that we leverage to offer affordable packages for our clients. So. If you are also planning to explore these destinations, then book a package on your own or call our trip experts for assistance. BookOtrip made my journey to Golden triangle memorable and the best part was the Elephant ride. Thank You for the wonderful experience!! !